NEW PAGE FOR OUR ADVERTISERS! 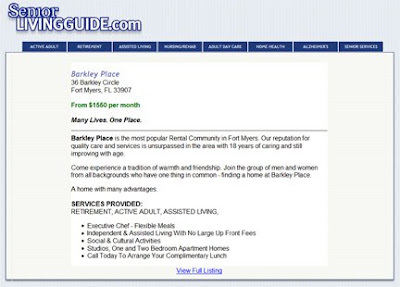 In an effort to get our senior housing advertisers even more traffic we’ve implemented a static page for each listing on www.seniorlivingguide.com. These pages are optimized for Google and other search engines and gets your community or service that much closer to the top of search results. These pages are in addition to your searchable listing in our database and come at no additional coat to our advertisers. www.seniorlivingguide.com and Senior Living Guide know the importance of thorough distribution on the Internet and this is just another way we are putting our advertisers in front of the right people, at the right time. Comments Off on NEW PAGE FOR OUR ADVERTISERS! Senior Living Guide is at the ALFA conference in Philadelphia PA. So far the show has been great and we’ve made lots of new contacts. ALFA conferences are a great opportunity for senior housing industry professionals to learn all of the new features and improvements Senior Living Guide & www.seniorlivingguide.com have introduced in the past year. We’ve been demonstrating new tools and products like our Grid Listings, Traffic Tracking, web Tracking and of course, our new website and the unprecedented growth we’ve had in the past 6 months. If you had a chance to make it to ALFA this year and you stopped by to say hello, THANKS. If you were not able to make it and you have questions, drop us a line, we’d love to speak with you! Comments Off on We're In Philly!